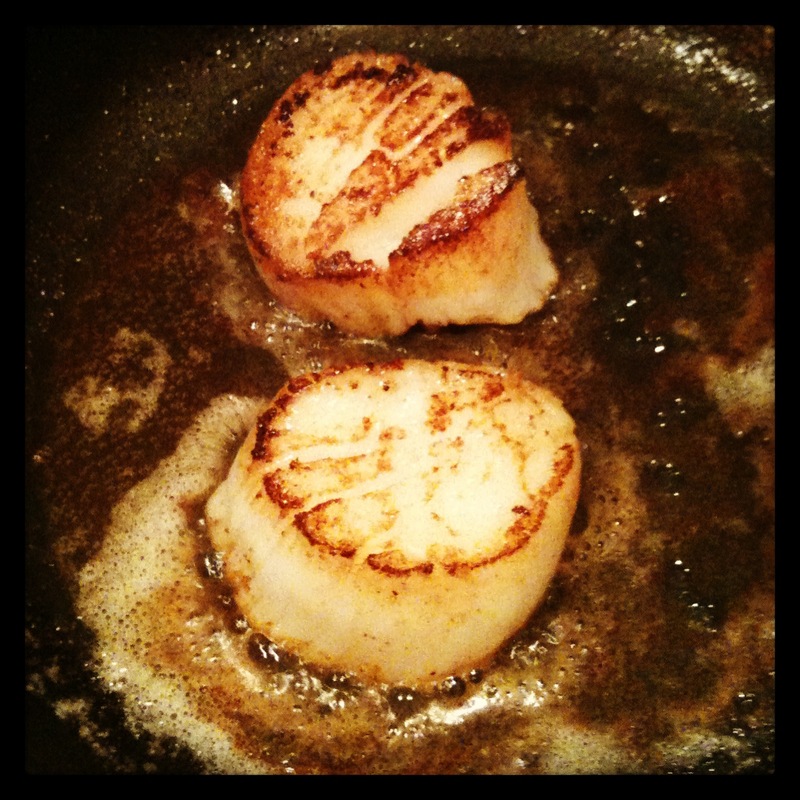 I was looking through some old photos and came across a few shots of some pan-seared scallops. Considering that scallops were my absolute favorite seafood as a kid, I thought it would be only appropriate to add them to this blog. In full disclosure, I did not actually make this batch of scallops for our little guy. These were an appetizer from a quiet New Years Eve dinner before our son was even born. However, the pleasant consistency and slightly sweet flavor of scallops make them an excellent choice to ease little ones into seafood, and they make a great treat for a parents’ date night as well. Scallops can be intimidating, but they’re actually very simple to prepare and incredibly delicious – so let’s get started! Scallops are frequently sold after being soaked in a liquid that preserves their freshness and maintains their color. When buying scallops, it’s important to be sure they’re fresh. Buy from a dealer you trust, and don’t ever buy scallops that have a fishy smell. When you’re ready to cook your scallops, rinse them off and pat them dry. Seasoning is up to you. I personally feel that the flavor of the scallop is best preserved by searing in salted butter and not seasoning the scallop at all. 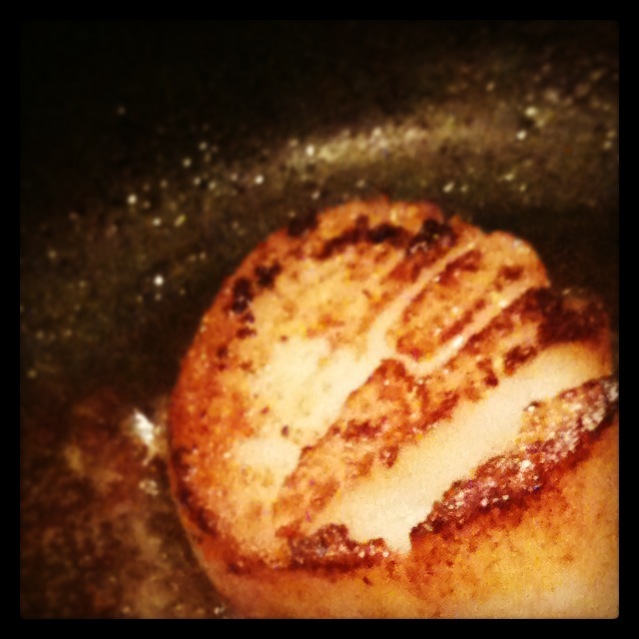 I find that the salt in the butter gives just enough of a saltiness to the scallop without being overpowering. More traditional recipes will suggest seasoning with kosher salt and cooking in unsalted butter. I don’t think there’s a wrong answer here – either way you end up with a giant scallop seared in butter and salt. Everybody wins. As far as further seasoning, I mentioned black pepper as optional. Sometimes I use it, sometimes I don’t. If I’m making a few batches, I may only pepper some of the scallops to have some contrast. This is, again, totally up to you and your personal tastes. When you’re scallops are rinsed, dried and (optionally) seasoned, it’s time to get a pan nice and hot. 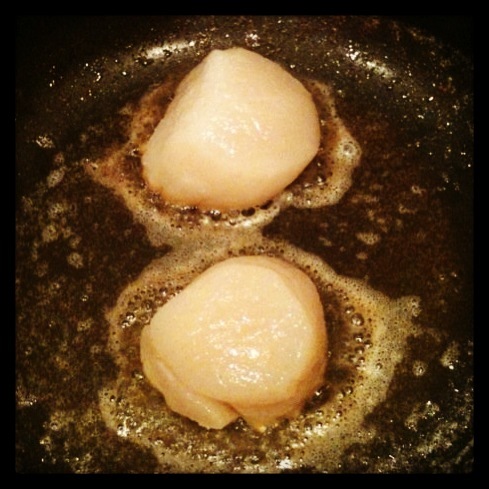 A non-stick pan is ideal so that the scallops will release easily. Heat a good amount of butter (I don’t have an exact amount, but probably a little more than you think you need) in a pan over a medium-high flame. Let the butter get hot and do not add the scallops until the bubbles in the butter have started to die down. Those bubbles are the water boiling off from the butter, and you want that water gone before you try to sear your scallops. When the butter is ready, place the scallops in the pan. I know what you’re thinking – “You said to let the bubbles die down!” – but those bubbles formed after the scallops went in the pan due to the moisture from the scallops, not the butter. I promise. This is going to be a very quick process. The scallops will sear for about 1 1/2 per side, 2 minutes at the most. They will continue to cook a little even after you remove the from the pan, so if you’re going to make a mistake with timing, you want to err on the side of undercooking. An overcooked scallop and a super ball have too much in common to make either one something you want to eat. After both sides have been seared, you should have a nice brown crust on the ends while the middle will remain somewhat translucent. This is exactly what you’re looking for. Serve them as quickly as possible after cooking as they will get rubbery as they cool. So, that’s it. Whether you serve them as an appetizer, an entree with the whole family or a special treat for date night, seared scallops are always a winner, and they make you look like a genius in the kitchen. Enjoy! 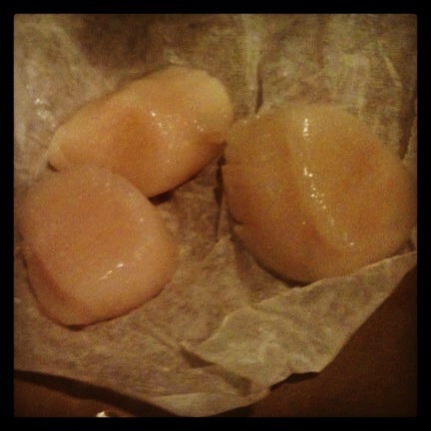 I just blogged a scallop recipe almost identical to this!